STELRAD VITA SERIES ROADSHOW – COMING TO A MERCHANT NEAR YOU! The successful Stelrad Vita Series Roadshow is back into gear for 2019 and coming to a merchant near you. The fully fitted out training van is giving installers up and down the country the opportunity to get to know the Vita Series which has transformed radiator buying in the UK. A series of events has been planned from now through to May so far, with further dates to be announced as the year progresses. The visits will be co-ordinated by the local Stelrad Brand Specialist and see the training van parked in the car park outside the merchants, offering installers the chance to get up close and personal with the Vita Series range of radiators, whilst enjoying a few treats. The Vita Series is made up of fifteen expertly selected radiators, offering value and design options to suit every budget and taste. It features simple and transparent pricing, using published trade prices so that installers can purchase the products and recommend the best quality solutions to their customers, at known, affordable prices. The Stelrad Vita Series comprises of the Vita Compact, the Vita Eco for those wanting an energy saving option, the Vita Silhouette, Vita Deco, Vita Deco Concept, Vita Column and Vita Column Concept for those wanting a designer radiator look, to Vita Plan and Vita Plan Concept – a flat faced, smooth fronted design and finally, the Vita Ultra – with bespoke colour finishes available. There are also the Vita Compact Vertical, Vita Deco Vertical and Vita Plan Vertical for those looking for a stylish choice in a smaller space. The Vita Series Roadshow will be coming to merchants in the North West and across Wales in February, the South West and South East in March, South and East London and East Anglia in April and Scotland and the North in May. You can see these and the other excellent Stelrad models by heading for the Stelrad website at www.stelrad.com, you can call for brochures and information on 0844 543 6200, or email marketing@stelrad.com . You can follow Stelrad on Twitter @Stelrad or on Facebook at www.facebook.com/StelradRadiators. 1. Why are you involved in the Heating Installer Awards? As the leading radiator manufacturer in the UK and a major manufacturer in the heating sector, we’re privileged to know that a huge proportion of heating installers in the country install our radiators on a weekly or even daily basis. So it’s with huge pleasure that we are a lead sponsor of the Heating Installer Awards. 2. What do you look for in a Heating Installer Awards entry? Detail, honesty and something ‘different’ – very few people or companies win awards by submitting ‘me too’ type entries. There needs to be a twist, at least one fact that will make your entry stand out from the crowd. Read your entry honestly and ask if you were the judge would you shortlist it for an award… if so, we want you to submit it! 3. What piece of advice would you give heating installers that are new to the industry? Winning awards is a great habit to get into. It gives you something to share with potential customers – and will help build credibility in your business. You have to start somewhere. So examine the entry categories and find one that fits your business. Good luck! 4. Why do you think that heating installers should enter the awards? It’s strange how some people make fun of awards until they win one! Winning awards is good for the business, good for the people who work with you and can begin to generate media coverage for you in the local press, on local radio and in the trade media. It can also help with recruitment – people like to work for successful businesses. We at Stelrad enter awards on a regular basis for manufacturers and we love winning! 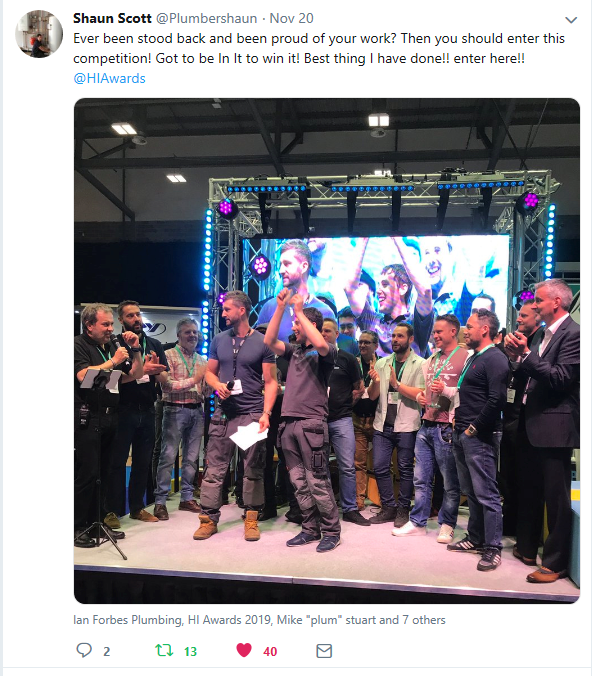 Sponsored by Danfoss, Geberit, Glow-worm, Polypipe and Stelrad, and media partnered with Installer magazine, the awards are free to enter and offer prizes up to the value of £10,000, including a coveted trip to Danfoss HQ in Denmark, Love2Shop vouchers, an Apple watch, a nextbase 412GW Dash Cam, asbestos training and so much more. The Heating Installer Awards look to recognise the achievement of plumbers and installers who deliver excellent customer service on a daily basis. 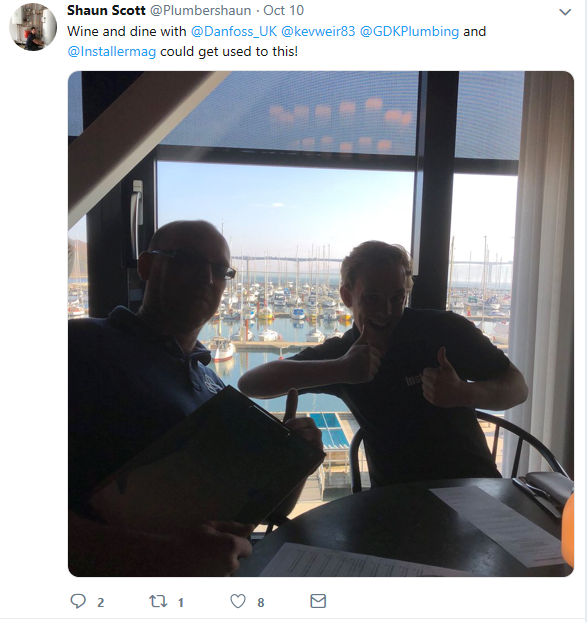 As well as recognition, the awards also aim to help heating installers and their businesses, by providing money-can’t-buy prizes, raising their profiles and connecting people within the industry. 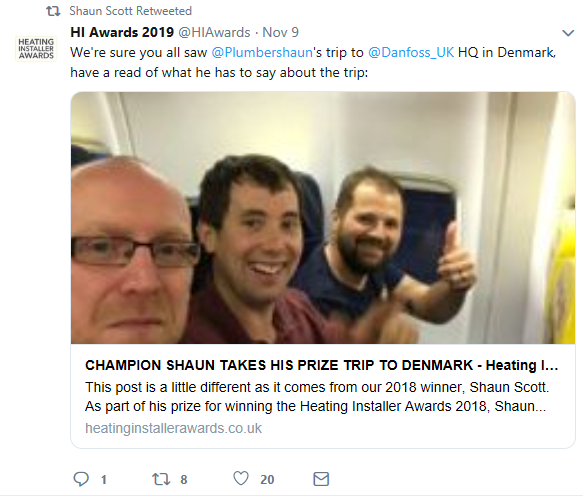 Helping boost businesses by giving credit to installers that deserve it is what the awards set out to do, and it’s great to hear that they are doing that and more for Shaun. We also heard similar feedback from Huw Jenkins, 2018’s runner up, Peter Booth, 2017’s winner, and many more of our previous winners! Need any more convincing? Check out some of Shaun’s recent tweets below, explaining what the awards mean to him and what he’s been getting up to following his win. Everyone deserves recognition for a job well done, and plumbing is no different! That’s why the Heating Installer Awards was created, to recognise and celebrate plumbers and heating installers who deliver top quality work and brilliant service to their customers. Now in its fourth year, the Heating Installer Awards champions excellence within the industry, and makes sure that those who deserve to be shouted about are! Our work has not been in vain, with many of those involved telling us that their businesses have benefited from being associated with the awards. Recommendations – more business! As Shaun said, more people are recommending him and therefore he’s receiving more business. This can lead to more choice for you and your business, even giving you the opportunity to expand or take on an apprentice. 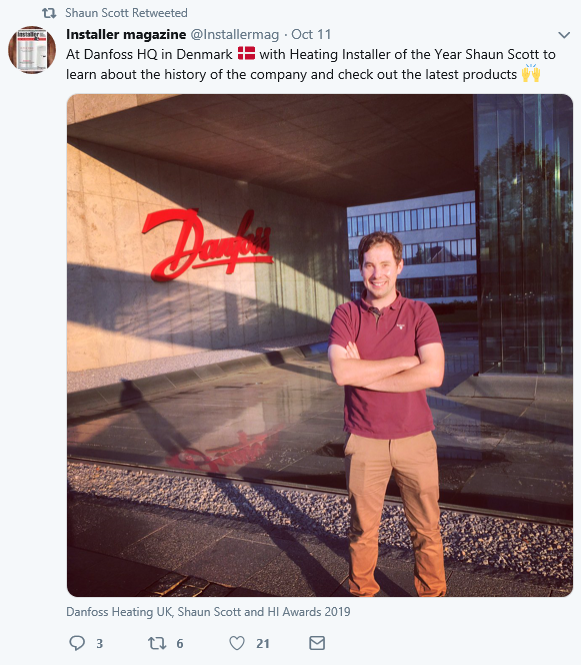 Partnerships – by being associated with the Heating Installer Awards, entrants are able to engage with other plumbers and businesses that they may not previously have had contact with, including our great sponsors: Danfoss, Geberit, Glow-worm, Installer Magazine, Polypipe and Stelrad! This can lead to a host of new opportunities, from recommendations from peers to product trials from companies.